There are many prepositions that are used with the verb COME to create everyday phrasal verbs in English. 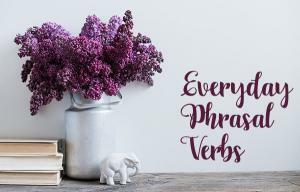 Here are some English language phrases and expressions which hopefully will help you understand how to use phrasal verbs with COME. Here are a selection of some of the more common choices with examples. There is an obvious use of this phrasal verb when we ask somebody to perhaps climb the stairs or steps to talk to you. For example, a parent may request a child to come up the stairs and go to bed. Please come up now! – a stern warning from a mother. Come up to my office I am on the fourth floor. – an office worker inviting a guest to his office. However, there are other uses of COME UP. Diversity is often not a topic that comes up in the conversation. A few issues cam up during the course of the project. Can you come up with a suggestion please ? I need to find a solution by tomorrow. – Can you think of a suggestion? Can you suggest something? The literal meaning is I hope obvious. We ask or welcome some one into our home or office. Come in! I am delighted to see you. That will come in handy. – Meaning that will be useful. When someone matures or becomes more professional or better at his job we can say he has finally come into his own. – He has reached his ability. He trained to be a professional footballer from the time he was sixteen. However, it took him about eight years to establish himself as a first team player (it took him a while to show his skill level). He finally came into his own when he was twenty five and played consistently well for many games. To come out literally means to leave some place. He came out of the hotel with his luggage under his arm. Again, however, there are other meanings of COME OUT. 1. When a company reveals or launches a new product, we can say they came out with a new product to compete with rest of the market. Coca-Cola have come out with their first alcoholic drink. 2. When we disagree with someone’s views strongly we can come out against their opinion. He was very annoyed that the Government did not do more to fight knife crimes. He came out strongly about his criticism in a newspaper article. Two million workers came out against the new bill, the whole country was paralysed. The book came out last month. It was really exciting. We use this phrase when we do not agree with someone and we wish to tell them that they are wrong or misguided. Come off it! That is rubbish. You cannot be serious that is very far from the truth! If someone loses consciousness or is knocked out for a short while they eventually regain consciousness and we can say they have come to or they are awake. So come on!! If you are still unsure how to use phrasal verbs with COME, try them out and see how you get on! I wish Mum came round to the fact that I am not a small child any more. To meet, find by chance. I came across my old toys yesterday when I was tidying the attic. Peter’s family recently came into millions of pounds thanks to his late father’s investment in a tech startup. How did you come by this beautiful bracelet? My friends came by this summer. Paula came over to my house for a conversation. So come on!! 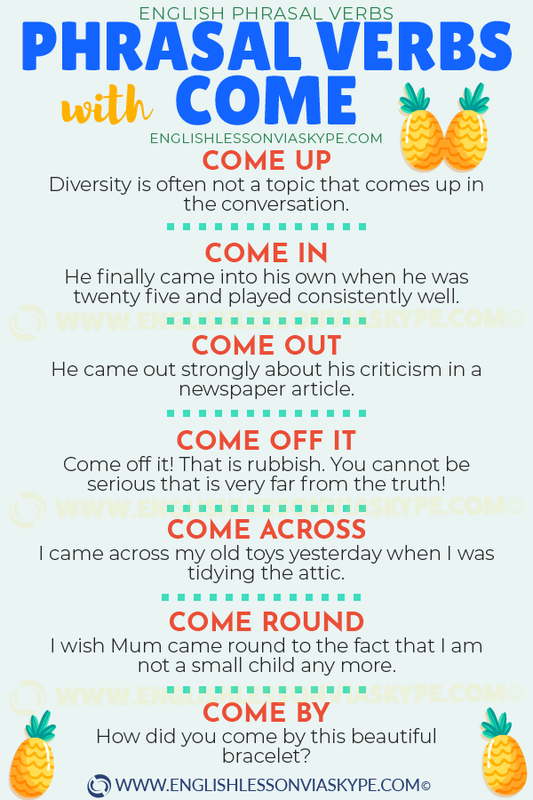 If you are still unsure how to use phrasal verbs with COME, try them out and see how you get on!! English learning videos are an easy way to improve your English speaking and listening skills. In this video English lesson you will learn English phrasal verbs with COME and their meanings. With the verb to COME we are going to use prepositions ON, IN, UP, OUT and ABOUT. How to use INTO and ONTO in English? This multi-choice quiz will help you learn phrasal verbs with COME.